6.30 a.m. Heavy wet snow is blasting past the windows. The land outside is white, a reversion to the winter. A journey to Aviemore in driving snow, roads wet and slippery, mostly snow free but patches on bends cause the tyres to slide slightly. Aviemore station snow and windswept but the train is on time and the family head off south, perhaps to warmer and sunnier weather. In a café I stare out at the steady snow and people walking fast, heads down, hoods up, shoulders hunched. Then home, the roads a little whiter now, the snow a little heavier, the visibility a little less. The snow is drifting in the gusting wind, a foot deep in places by mid-afternoon. Light fire, cut more firewood, decide the weather is best viewed from inside the house. Twelve hours after I first looked out at the blizzard and the snow has not eased for even a second. Still it drives across the land, a hazy white sweep of snow blurring and softening the fields and woods. The forecast is for it to continue overnight, perhaps becoming even heavier. The Met Office has issued a flash warning for severe blizzards and very heavy snow – perhaps 30 centimetres with big drifts. “Roads are liable to become impassable and some interruptions to power supplies are possible.” In the mountains the winds are forecast to reach 80mph. Whilst probably not as severe as now the cold snowy weather will continue for the rest of the week and into the weekend. Easter will be tough in the hills. The winter is not yet over. The vernal equinox when the hours of dark and light are balanced marks the traditional start of spring. Winter is over and light and warmth will now dominate for months to come. A walk on this day is a welcome to the returning and strengthening sun. Happy to shed the winter accoutrements needed for the still snow-clad highest hills I headed for Glen Roy and its lower and now mostly snow free tops. The weather was not co-operating with the theme of spring and sunshine however. A bleak, damp wind whistled down the glen, spattering drizzle against me. Grey clouds hung low, well below the summits. Newly free of snow the ground was a dull grey-green, last year’s faded grass lying wet and flat. I’d passed catkins hanging thickly on the trees as I drove up the lower wooded glen. But here in the upper glen amongst the rough sheep pastures there was no sign of the changing year. I climbed through dark heather above Coire na Reinich and into mist and heavier rain that carried hints of sleet and wet snow. The little summit cairn came and went quickly. I had no desire or reason to stop. Then, descending over Carn Bhrunachain, the clouds started to lift, revealing flat-topped hills rippling into the distance. There was even some weak sunshine half-lighting patches of hillside and almost bringing a suggestion of brightness and colour to the washed-out vegetation. Back down in the glen the snow-melt swollen River Roy raced down water slides and cascades. The famous Parallel Roads – the shorelines of ancient lakes held in the glen by ice dams – were pale streaks across the dark slopes. Down the glen a split in the clouds revealed the shining white still-winter peaks of the Grey Corries, a fine view on a day of misty haziness and soft-edged scenes. High above an eagle soared, circling round and round above the land. Spring will come here but not yet. Where now for Ben Nevis? Switching on the computer this morning I was skimming through the mostly trivial posts on Facebook when my attention was caught by one from Cameron McNeish regretfully announcing the closure of the Nevis Partnership, of which he is the chair. The Nevis Partnership, a charity pledged to “guide future policies and actions to safeguard, manage and where appropriate enhance the environmental qualities and opportunities for visitor enjoyment and appreciation of the Nevis area”, will close sometime next year due to lack of funding. For the last seven years the Nevis Partnership, made up of a wide variety of groups including community councils, Highland Council, the Mountaineering Council of Scotland, the John Muir Trust and Scottish National Heritage, has worked for the conservation and restoration of Ben Nevis and the surrounding area. The closure of the Partnership means the loss of three jobs and the end of plans for repair of the lower Ben Nevis Track as well as other projects. Does this matter? I think so. Generally I’m not in favour of much management of the hills. Wild areas should be left to be wild. Reducing grazing pressure and repairing footpaths is about all that’s needed in much of the Highlands. Ben Nevis is different though because it’s the highest mountain and therefore very popular. Over 150,000 people are estimated to climb it every year. And then there are all those who visit Glen Nevis and walk its footpaths but don’t climb Ben Nevis. This huge volume of visitors puts enormous pressure on footpaths and the natural environment so some management is needed. Now the local community and the various landowning bodies will need to find a way to work together to achieve this. There is also Friends of Nevis, a charity set up by the Nevis Partnership, which Cameron says will continue and which will now be even more important. Ben Nevis is not just the highest mountain in Scotland, it’s also one of the most impressive with the biggest and most spectacular cliffs of any Scottish hill. 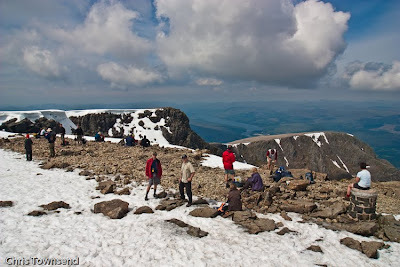 On a sunny day in summer, when the mountain is thronged with walkers and it would not be surprising to see an ice cream van on the summit and a row of deck chairs overlooking the great North Face, it might not seem wild but climb to the top up the snow and ice of the cliffs and descend in a storm or camp alone on the summit and all the glory and wildness of Ben Nevis returns and it is seen in its full magnificence. 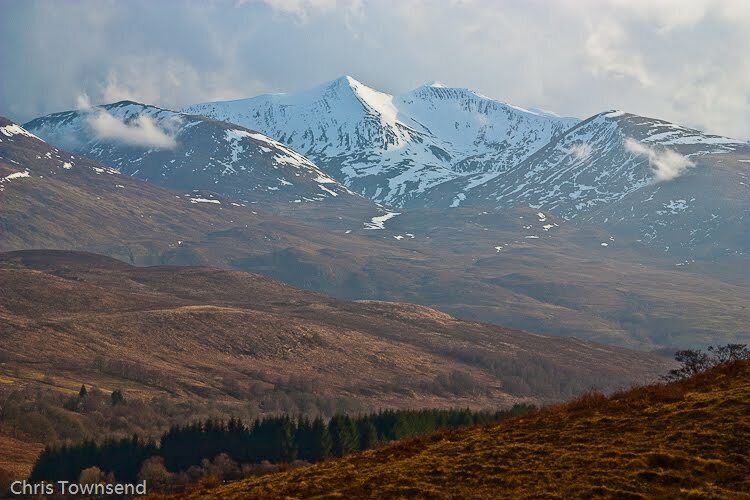 This iconic mountain deserves funding as a key part of the national heritage of Scotland. 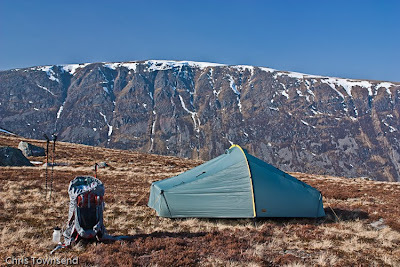 If Ben Nevis is not worth any money where is? 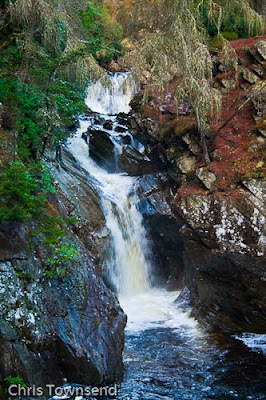 On the southern edge of the Highlands near Dunkeld in Strathtay lies the beautiful wooded gorge of the River Braan. The National Trust for Scotland owns a section of the land here, known as The Hermitage, where there is a folly called Ossian’s Hall overlooking the Black Linn Falls. Much of the woodland was planted in the 1800s but it has grown quite wild and many trees are self-seeded, including a magnificent Douglas fir right on the edge of the River Braan that is reckoned to be the tallest tree in Britain by Forestry Commission Scotland, who have measured it at 59 metres (194 feet). The deep gorge with the river rushing down water-smoothed rocks in cascades and slides below the towering forest is quite magnificent and a wonderful place to stop for a quiet restorative stroll away from the noise and pressure of the main road just above, something I have done several times. That such a place of beauty and wonder should have been threatened by a hydro scheme seems inconceivable but such was the case until recently. The development would have diverted over 60% of the water from the river at times which, as at the Birks of Aberfeldy not far away (see posts for Novermber 22, 2009 and February 24 this year), would completely change the nature of the gorge. The River Braan is a free river and should remain so. It’s also a special river for canoeists, rated as one of the top five in Scotland, and the Scottish Canoe Association led the fight against the scheme. The Scottish Environment Protection Agency, a government body, also opposed it and a public enquiry in January 2009 recommended rejection. Last week Scottish Ministers agreed and the proposal is dead. Mike Dales, Access & Environment Officer with the SCA said “the Scottish Canoe Association is pleased with this decision. It is the correct decision and shows respect for one of Scotland's most beautiful rivers. The Braan gorge is enjoyed by walkers, canoeists and thousands of visitors who pass by on the A9 every year. It is welcome news indeed that this attempt to industrialise such a unique river by diverting its water away from the gorge has been rejected." The big rounded hills either side of the Drumochter Pass are some of the most well known in the Highlands, lying as they do above the main road north to Inverness, though they make for unremarkable hillwalking. Navigation can be problematic in poor visibility as the terrain is often featureless. When it’s clear there are good views, especially over Loch Ericht to Ben Alder, but these can’t be described as exciting hills. I suspect that if they weren’t so accessible they would only be climbed by Munro baggers. However when under snow this all changes and the hills seem much bigger, more mountainous and more challenging. On skis they are a delight. However deep heather on the lower flanks means that much snow is needed for ski touring. 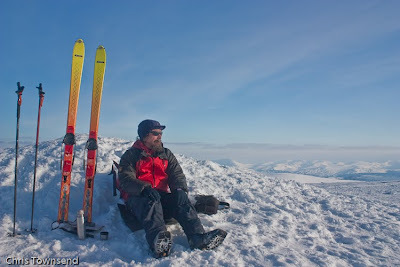 This year’s exceptional snowfalls seemed ideal and a few days ago I took my skis for a circuit of the three Munros around long Coire Domhain, which stretches into the hills from the top of Drumochter. The Allt Coire Dhomhain was half-frozen, gurgling through icy boulders and below snow bridges, and the hills above shone in the sunshine as I set off up the corrie. Climbing skins on, I ascended the relentless slopes of the first summit, A’Mharconaich, a steady plod that I remembered as much tougher and more tedious when walking. Across the corrie the long ridge of Sgairneach Mhor looked impressive. The high level ski from A’Mharconaich over Beinn Udlaimain to this final summit gave great views of the surrounding snowy hills, a real arctic landscape stretching to the horizon in every direction. The rippled snow was refrozen and wind blasted, making descents tricky and requiring concentration as my light skis bounced and chattered over the hard surface. The noise of the traffic on the A9 road soon disappeared and from Beinn Udlamain, the highest and furthest from the road of these hills, though also the least distinctive, it was possible to believe that there was nothing but mountains for many miles. I had the hills to myself too, seeing just one distant party descending Sgairneach Mhor. When I reached it that descent, all the way back into Coire Dhomhain, was long and engrossing as I searched out the smoothest slopes for the easiest skiing and then, lower down, snow-filled shallow gullies between the big moraines that line the floor of the corrie. A firm snow bridge led across the burn then it was a final ski down the corrie in the dusk at the end of yet another fine day out in this long and wonderful winter. The April issue of TGO is just out. My backpacking column is about the pleasures of backpacking in spring, though I suspect that this year I’ll be backpacking in snow for much of the season! But the longer daylight and warmer temperatures will still be here – indeed, they are already noticeable. My gear review covers fifteen pairs of soft shell trousers, which have all been tested in winter weather. Elsewhere in gear John Manning reviews trail shoes and describes the gear he used on a backpacking trip in the Yorkshire Dales while Eddy Meecham looks at the toxicity of methylated spirits (as a stove fuel of course!). Amongst the other interesting contents are Emily Rodway’s interview with Mark Diggins, Co-ordinator of the Scottish Avalanche Information Service, Alastair Lee on his new Lake District photographs book (with some tempting images), Cameron McNeish on Moffatdale, Ed Douglas on Nepal’s forgotten frontier and a delightfully splenetic column on the National Trust and its list of favourite walks by Jim Perrin. This winter has seen many marvellous days with the mountains shining in the sun and the views sharp and clear. The lack of wind and the masses of snow has made ski touring a delight both in the woods and high in the hills. Two days ago I made my annual tour across the Cairngorm Plateau to Ben Macdui on a day that felt more alpine than Scottish. Last weeks heavy snowfall has left the hills plastered with deep snow with barely a rock showing. The cliffs of the Northern Corries are whiter than I’ve ever seen them before. Climbing the Fiacaill ridge above the Cairngorm ski resort I could see the half-buried funicular railway far below. High on the west wall of Coire Cas a long corniced ridge hung above the upper ski runs. Suddenly there was a dull thud and a puff of smoke, the first of three such explosions during the day as an attempt was made to reduce the avalanche danger. The result was just a faint brown stain on the snow so the slope must have been stable at the time. I was happy to head away from the resort across the plateau. As I did so I left behind most of the people I’d seen along the rim of the Northern Corries. Few, it seemed, were heading into the heart of the mountains. As I crossed the shallow bowl of the Feith Buidhe I was alone in the vast whiteness and suddenly felt small and exposed. But also elated and excited. What a privilege to be here in this splendid mountain fastness. I surveyed the snowy slopes, very different from those before the big storm of last week. 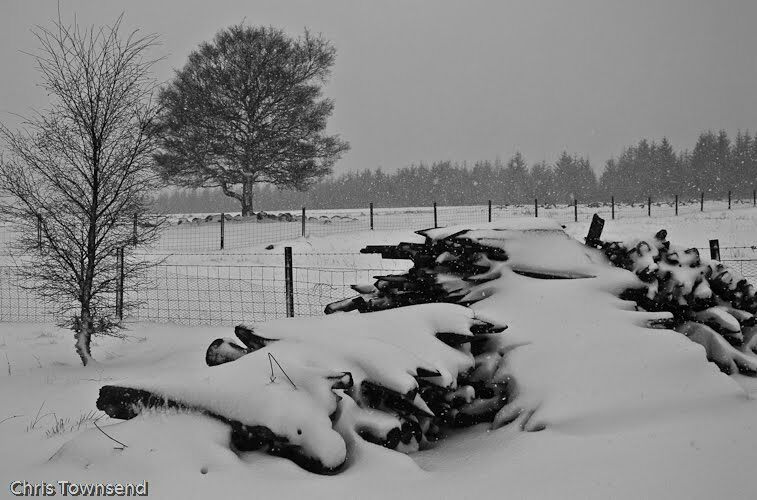 Then the snow had been a white blanket, spread smoothly over the hills with barely a break to disturb its surface, softening contours and flattening out bumps and dips. That snow had fallen on windless days, spreading evenly over the hills. The recent storm had come with strong winds, leaving the surface of the snow looking like a frozen choppy sea, broken waves and ripples spreading out everywhere. The sparkling fresh powder I’d walked on had vanished, replaced by dull, chalky white, wind packed snow and shiny, icy, old hard snow scoured by the wind. There was much sastrugi, carved by the blizzard. This made skiing awkward in places and I zigzagged around, picking a route around the hard-edged ridges. Approaching Ben Macdui two distant skiers appeared, small and lonely on the snow with massive Braeraich rising beyond them. Then two snowshoers passed me descending. Arriving quite late in the day I had the summit to myself. For the first time ever I could ski onto the very top, the summit trig point, which sits on a huge cairn, completely buried. I have never seen so much snow on Ben Macdui. I also noted that there were no boot prints leading to the top, only ski and snowshoe tracks. The snow was just too deep for comfortable walking. 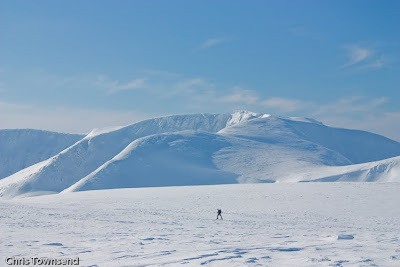 I circled the summit admiring the views of snow hills disappearing into the horizon then skied back across the plateau to Lurchers Gully, which gave an enjoyable descent on hard windslab. The final traverse across the mouths of the Northern Corries again showed how much snow there was, with the streams running out of the corries completely buried. As dusk fell I finished the tour and wondered how long this snowy winter, this real winter, will continue. The Cairngorm Funicular Railway is an ugly scar on the mountain that should never have been built. Now the business case for its construction has been condemned by the Public Accounts Committee of the Scottish Parliament in a report called Review of the Cairngorm funicular railway. The findings of the committee are damning and basically say that Highlands and Islands Enterprise funded the construction with public money without bothering to properly assess the business case for the funicular. This meant, says the committee, that “the project was pushed forward without proper regard to the risk to the public purse.” The committee also says that HIE was determined “to proceed with the project at any cost”. This comes as no surprise to those of us who opposed the construction of the funicular as it was apparent then that there was little chance of it being profitable but that HIE wanted to expand the ski resort and, smarting from losing two public enquiries about plans to expand into Lurchers Gully, was determined to defeat conservationists . Private business thought so too and not a single penny of private investment could be raised. This was wise as the funicular has operated at a loss since it opened in 2001. The total of public money spent on this white elephant is now £26.75 million. And HIE want more, leading the committee to say it is “concerned that, given the history of loss-making by the business, HIE’s commitment to the project appears to be open-ended”. The committee demands that HIE produce a new business plan that “must be founded on a realistic assessment of the future viability of the facility”. HIE’s plan is to spend another £4 million of public money to maintain the funicular and bring it up to a standard where it can be sold to a private operator, if anyone mad enough to take it on can be found. And how come after all that money has already been spent that more has to be spent in the vain hope it can eventually be sold? The whole episode stinks. Building the funicular resulted in massive damage to the mountain, as anyone who observed the construction, as I did, knows, and we now have a useless eyesore that is losing money. The funicular should have no further public funds and should be removed and the land restored as far as possible. It is both an environmental and financial disaster. 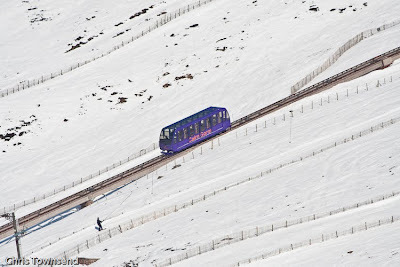 Ironically, the funicular is currently buried under deep snow and so out of action at a time when the Cairngorms has the best snow cover for many years.